A major obstacle to native orchid production is difficulty in seed germination. 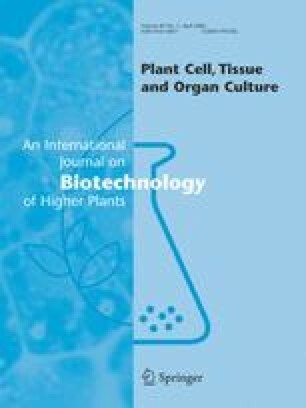 Culture media and light effects on seed germination of Calopogon tuberosus var. tuberosus, a native orchid with horticultural potential, were studied. Culture media included Knudson C, Malmgren modified terrestrial orchid, and PhytoTechnology orchid seed sowing. Effects of 8 weeks continual darkness, 8 weeks 16-h photoperiod, 2 weeks dark followed by 6 weeks 16-h photoperiod, 4 weeks dark followed by 4 weeks 16-h photoperiod, and 6 weeks dark followed by 2 weeks 16-h photoperiod were examined. Percent seed germination was highest on Knudson C after 8 weeks culture; however, seedling development was enhanced on PhytoTechnology seed sowing medium during 8 weeks culture under a 16-h photoperiod. This suggests that while KC and darkness promoted seed germination, P723 and light enhanced further seedling development. Seedlings of C. tuberosus readily acclimated to greenhouse conditions. The authors thank Scott Stewart, Environmental Horticulture Department, University of Florida, for his comments regarding the manuscript, as well as critiquing the experimental design and protocol. Brand names are provided for references, and the authors do not solely endorse these products.